David Lawson, left is congratulated by show judge Tony Swires, as the Craven Dairy Auction champion takes centre stage. 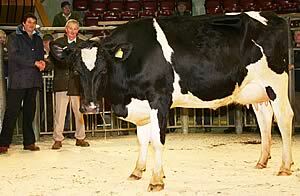 His newly calven Holstein Friesian heifer, which had calved three weeks before the fixture and came to market producing 32 litres, is by the renowned British-bred Genus sire Picston Shottle, often referred to as the “daddy of them all” and for many years the country’s most in-demand dairy bull. Out of a home-bred cow, the title winner sold for £2,200 to Aubrey Greenhalgh, Preston, though it was the second prize newly calven heifer from Peter Baul, of M Baul & Partners, Bishop Thornton, that achieved the show’s top call of £2,220 when falling to John Dodgson, Bank Newton. The first prize newly calven cow and reserve champion was a home-bred 25-litre second calver from Ian Parkinson, of MD Parkinson & Son, Barden, acquired at £1,800 by Peter Longster, Fellbeck. Best of the in-calf heifers again came from John Broadfield, Dewsbury, who continues to disperse his Chidswell herd after coming out of milk production in April to run his own Chidswell Farm Shop. His four pedigree dairy cattle sold to a top of £1,530 to David Shuttleworth, Gargrave. A consignment of maiden heifers from G&J Dean, Slingsby, York, was responsible for the best of the maiden heifers, the class winner selling for £700 to David Leeming, Elslack. With 51 dairy cattle forward, newly calven heifers averaged £1,685, newly calven cows £1,654, in-calf heifers £1,205 and maiden heifers £522. Show judge was Tony Swires, Stainburn, Otley.